Samana Top Vacation Rentals : Samana Apartments, Houses, Villas & Condos for Rent in Dominican Republic. Apartments, Houses, Villas and Condos for Rent in Samana. A truly spectacular view of the Bridges of Samana from up in the lush Samana Hills. 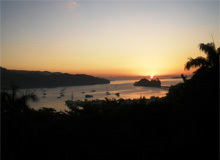 Breathtaking sunrise in Samana City viewed from the surrounding hills. 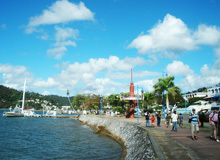 The beautiful scenic walking waterfront boulevard called "Malecon" of the small town of Samana. The lush virgin Samana Peninsula viewed from the Hotel Cayacoa in Samana City. 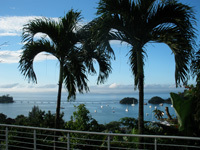 The town of Samana offers a good choice of Vacation Rentals for a short stay of a few weeks, months or all year long. These are the better quality lodging options located in and around the center of the town, within walking distance of everything. You will find nearby all the restaurants, bars, markets, shopping, banks, malecon, marina and the spendid bay of Samana. Some of these rentals are located a few kilometers away from Town. 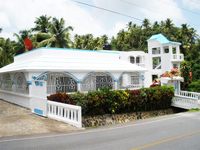 Samana Vacation Rentals - Vacation Rentals in Samana Town Dominican Republic. 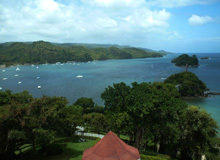 VISTA OCEANO Apartments offers superb scenic views on Samana Bay. 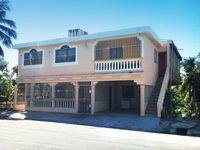 Great location right downtown in the hills of Samana within a few minutes walking to everything. 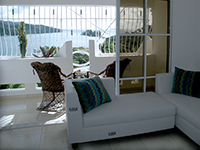 3 fully furnished Apartments of 1 BEDROOM with private Balcony for your vacation in Samana. Located on top of beautiful Samana Hills. Buchen offers 4 fully furnished Apartments with Pool, Color TV and AC. 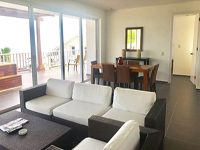 These Apartments rentals of 1 BEDROOM for short or long term stay have a truly spectacular view on the Marina, the Town and the Bay of Samana. Small, quiet and intimate Apart Hotel located in one of the best neighbourhood : Samana Hills. 6 well appointed rooms with AC for short or long term stay. 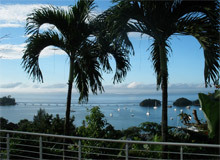 Spectacular views on the Marina and Bay of Samana. We have also 1 Private APARTMENT with AC available. Samana Vacation Rentals in Dominican Republic. 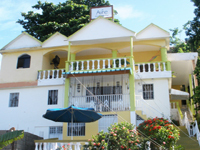 Alta Vista Apartment Rentals for Long Term stay or Short Term vacation. Afordable fully furnished Apartments of 2 BEDROOMS with Air Conditioning, Cable Color TV, WiFi and Pool with Patio area. Quiet neighborhood. Veranda with superb views of Samana Bay. 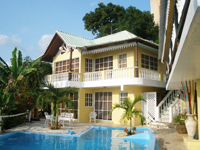 Trade Winds Rentals offers 1 Fully Furnished Home with two bedrooms and 6 Apartments for your Vacation in Samana. Pool, AC, WIFI and Private gated parking. Excellent location 100 Meters away from Playa Anadel beach, only a few minutes from Downtown Samana. Samana Vacation Rentals : Condos for Rent in Samana Peninsula Dominican Republic. 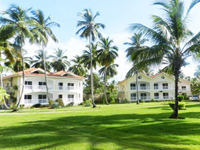 Samana Apartment Rentals : Apartments for Rent in Samana Dominican Republic. Samana Villa Rentals : Luxury Villa for Rent in Samana Dominican Republic. Apartments for Sale in Samana Dominican Republic. NEW Apartments for Sale in Samana Dominican Republic. Apartments of 1 Bedroom, 2 Bedrooms and a Penthouse for Sale in Las Pascualas located only 10 Kilometers from the town of Samana. Perfect location at 100 Meters from Beach. Prices starting at only $55,000 USD.